I recently read that we’ve explored less than five percent of the ocean. It reminds me of an old journalism saying that real news is what people want to hide, and everything else is publicity. At MACIAS PR, we believe that real news and publicity can work together. When the timely, editorial angle is focused around the client, publicity can turn into real news. 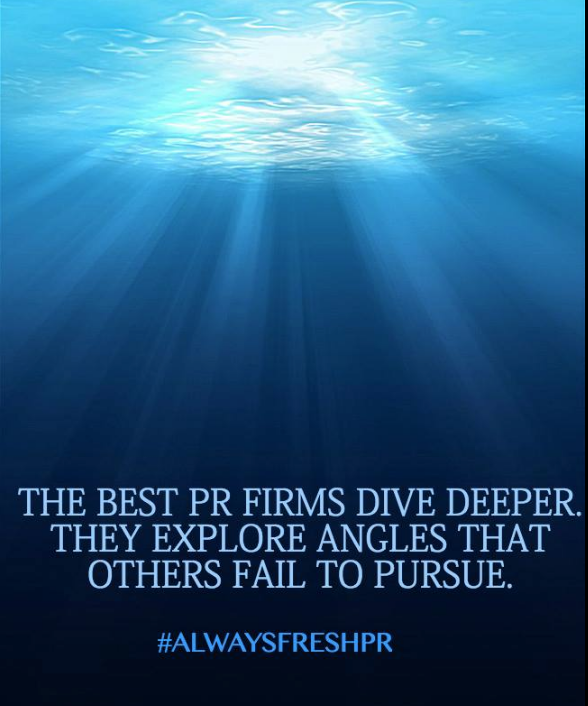 This is why we dive deeper than other PR firms, searching for the strongest news peg. We want to uncover that 5 percent of the ocean that hasn’t been explored yet. From TV shows to online publishers, the best publications and programmers understand that quality and insightful stories attract viewers and readers. This understanding of programming is a huge factor behind the consistent coverage that MACIAS PR secures for our clients. During my time as an Executive Producer with NBC, I oversaw Special Projects programming that played a pivotal role in ratings. In simple terms, I was in charge of generating ideas that would keep NBC #1 in news. That creative story generation is still being put to use – only now we share it with our clients. Many business owners and marketers wrongly believe that who you know leads to coverage. Unfortunately, that’s not the case when it comes to PR. You can have the best contacts in the media, but if you don’t have insightful and enlightening ideas, your story will never gain traction with the media. This is why MACIAS PR is built on stories first. Every morning, our team is brainstorming on new angles to position our clients on the news. We have a methodical formula that ensures every client’s campaign is leading the news agenda. So the next time you’re researching PR firms, or interviewing PR reps for help, ask them to tell you a good story. Was it insightful or enlightening? If you weren’t moved, it’s highly likely that a journalist won’t be moved either. The founder of the firm, Mark Macias, is a former Executive Producer with NBC and Senior Producer with CBS in New York. His media experience provides the firm with an insider’s perspective on how news stories are placed. Macias is author of the business book Beat the Press: Your Guide to Managing the Media and frequent contributor with CNBC and The Daily Caller where he gives PR, media and crisis advice on timely business and political stories. MACIAS PR, which was founded in 2009, offers a wide range of services, including publicity, media outreach, introduction to journalists, messaging, social media, video production, crisis communications and original content for blogs/newsletters.